DTS is helping agencies bring in the data when connection isn't an option. ORLANDO, Fla. - July 17, 2018 - PRLog -- Central Florida-based Engineering and software company Data Transfer Solutions, LLC (DTS) released its newest mobile application, FacilityVUE. 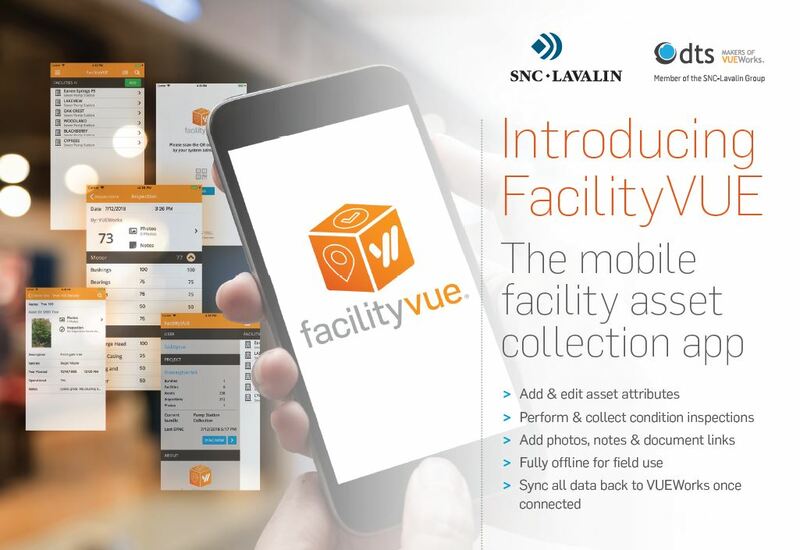 Available on iOS, Android and Windows Mobile (UWP) platforms, this latest Facilities management app allows field workers to digitally add facility assets, add and edit attributes and collect condition inspections - all with the tap of a finger. The application also supports photos, comments and document links. Since most facilities are indoors, where Internet connections can be fickle, the new application was designed for fully off-line use. Once Internet connectivity is re-established, all updates can be synced from the app back into VUEWorks, for a seamless integration. This will be especially helpful for agencies tracking a large inventory of non-spatial assets, such as water treatment plants, who need to track the condition of valves and pump stations. The application itself is free to download, but requires VUEWorks login credentials and a license of the VUEWorks Facilities module. Current VUEWorks Enterprise License clients can reach out to their designated Project Manager for details on application configuration and training. VUEWorks users who are tracking GIS assets and Work Order management are encouraged to continue use of MobileVUE. VUEWorks® software is an affordable, web-enabled GIS-integrated enterprise asset management solution. VUEWorks is designed for use by state and local governments, utilities, corporations, schools, theme parks and other organizations that need to track the condition, minimize failure risk and optimize expenditures and service delivery of their physical assets. VUEWorks integrates directly with GIS data, allowing users to share geospatial and non-geospatial data on any physical asset within any infrastructure domain. Typical domains include transportation, utilities (water, wastewater and stormwater), facilities, fleet, power (generation, transmission and distribution), oil and gas pipelines, airports, seaports and commercial property management. More information about VUEWorks Performance-based Asset Management, all modules and mobile applications can be found at http://www.vueworks.com.